The UUA’s September Action of the Month was Tents of Hope for Darfur. The program is ongoing and there are many congregations who are continuing to collect postcards, pitch tents, and even planning to come to D.C. for the national gathering, November 7-9th. 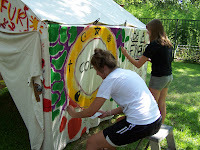 A story about UU involvement in the Tents of Hope project has gone up on www.uua.org. We encourage you to read the story and if you have one of your own, please send it (along with pictures) to Alex Winnett at awinnett@uua.org. Thanks!